Since 2000 there has been an increasing curiosity by the international community in the astonishing speed of China’s emergence on the globe as one of the key players and a potential competitor of the American superpower. This situation will not only enable the international framework to reshape itself, but also makes China become more uncertain in terms of its social, cultural, and political prospects. Thus the world is shifting its attention to the young Chinese generation who is born into earlier 1980s, and grow up with the open and reform program. Their attitude will be an important reference to China’s palpable future. As the most sensitive group of this generation, Chinese young artists’ creation is perhaps the parameter to foresee China’s tomorrow. In Chinese art world, one of the most obvious phenomenon in recent year is the coming out of age of many young talented Chinese artists whose art practice is recasting the conventional appreciation and perception which is dominated by Western art establishment. This forces international commentators to re-examine the new art without a prejudice. 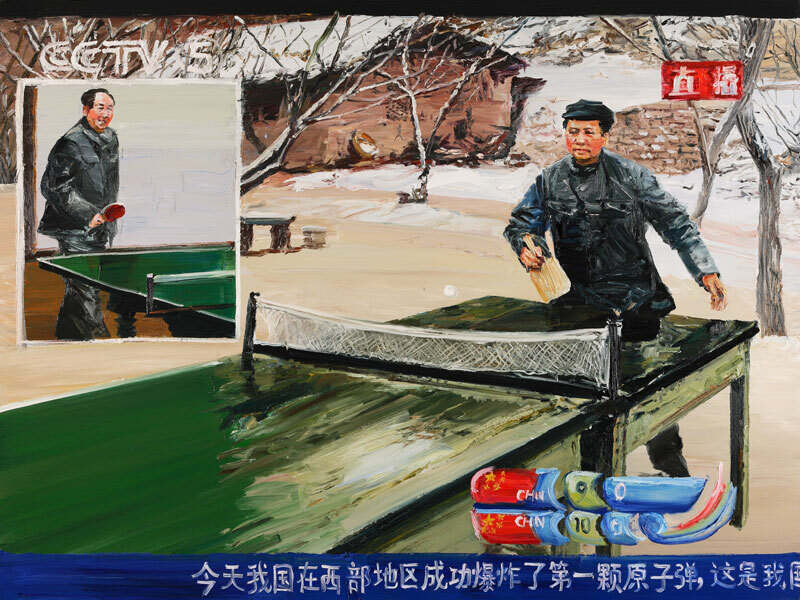 No longer reflecting back to the ideological-charged western projection and imagination of China, they pay attention wholly to current social reality- to capture the nature of a changing and uncertain life and that contemporary Chinese art is down to the earth. Li Qing (born in 1981 in Zhejiang province) is a graduate student at China Academy of Art and one of the representatives of this new generation. Over the last few years his art has been included many important exhibitions and rewarded several grants and awards, due to his excellence of performance – the mastery of refined and personal technique, the wide social concerns, and the appropriate representation. Executed in the very traditional medium of oil on canvas, the generally mid-size paintings are usually paired pictures. On his canvas an impression between the figurations and an abstract-gestural style is obvious. By first glance his bright and semi-translucent canvas is easily recognized. The juxtaposition of two similar pictures is one of the most notable characteristics of his current series Point out the Difference, a pastime computer game, which tests player’s visual perception, inspired him to do the series. The pairs of picture are seemingly the successive snapshots capturing the two moments of a seemingly consecutive event, a body, a face, a place, an object, or a person. There is very little difference between the two pictures at first sight, and there are several minor distinctions between two upon a careful scrutiny. This reminds viewers about the sense of time and lived experience. The series of pair paintings covers a wide variety of subject matter, but many of them are less significant. 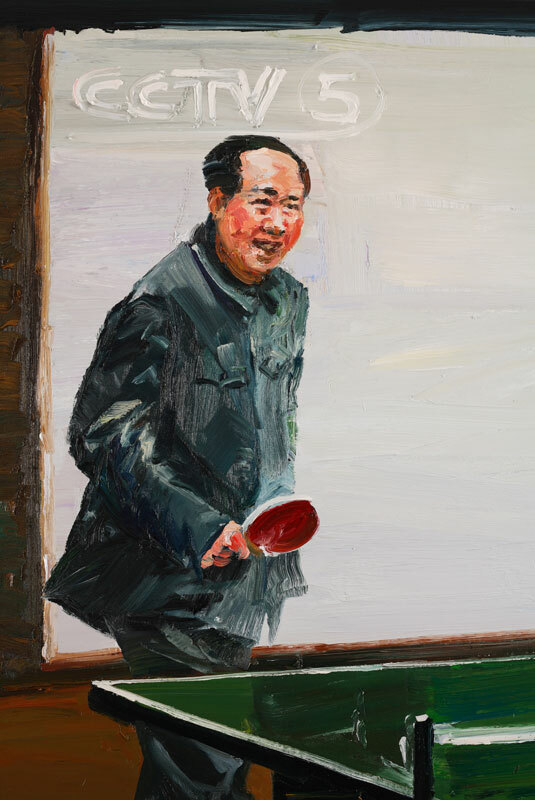 Sometimes he recreates scenes from the memories of the socialist revolution, daily life, social gathering, and international relations, such as street dancing, old photograph, parade, international conference, or Mao statue. The repertoire suggests a media manipulated visual realm, the second reality. In this mass media era, people’s perception of the world is more from the screens and less from the physical surroundings. Juxtaposition is one of the key methodologies of contemporary art practice. In Li Qing’s work juxtaposition usually occurs between two similar subject matters or scenes but in difference chronologically. The tension or relation between the two is usually the resource of concept of the work. 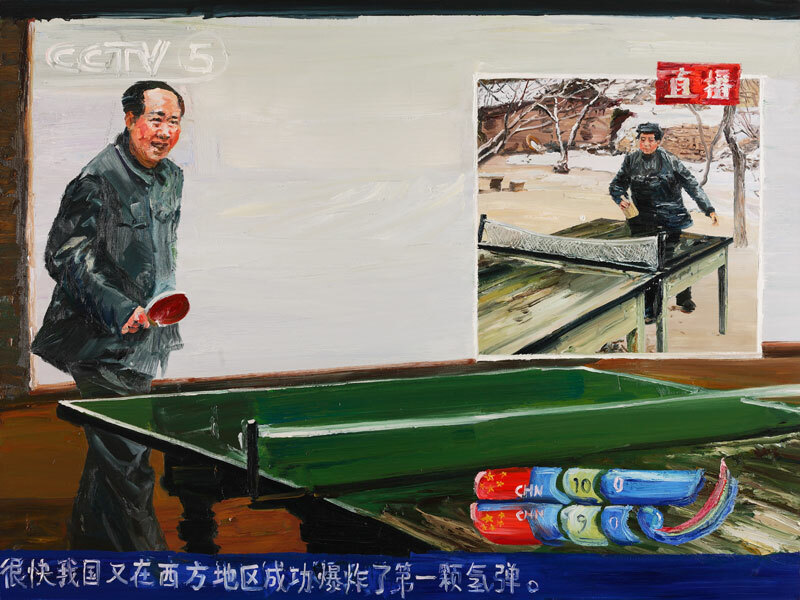 In China’s art scene the juxtaposition of old and new, which reflects the remarkable social transition taking place over the last three decades, was/is popular. As the method exactly reflects the current identity of Chinese people who are surrounded by consistent remarkable transitions in a territory where old and new are mixed. Li Qing is a great practitioner of oil painter. With his bold brush stroke, exact impasto, and, he smartly turns the visual games and subject matter into his own painterly game, a pictorial world that reflects changing reality. The blurring of the images not only suggests the digital visual world that surrounding us, but also the uncertainty of the changing world. Thus his creation oversteps the stylistic boundaries to sabotage clichés about Chinese contemporary art. As the artist puts it, “I am merely a computer programmer who is making a simple game by hard working and old fashion.” Li Qing is making a simple and easily accessible visual world where audience may exchange idea and share a common feeling. Many of the prototypes of contemporary Chinese art were heavy in their subject matter in order to express artists’ negative attitude towards the current corruptive system. Even though his work present some views of public and political life but hard to tell his comment, like a pair of mirrors exactly reflecting two moments (or from slightly different angle) of an event or a scene. On the other hand the strong stroke of the brush and bold impasto as well as pigment texture are integrated to suggest a reality that is filtered by mass media or computerization, using Boudrillard’s a simulation of the real. In this sense Li Qing does not tell what a concrete scene or story is, but indicating a visual experience to the contemporary world, or put it simply, his impression of the shifting life. 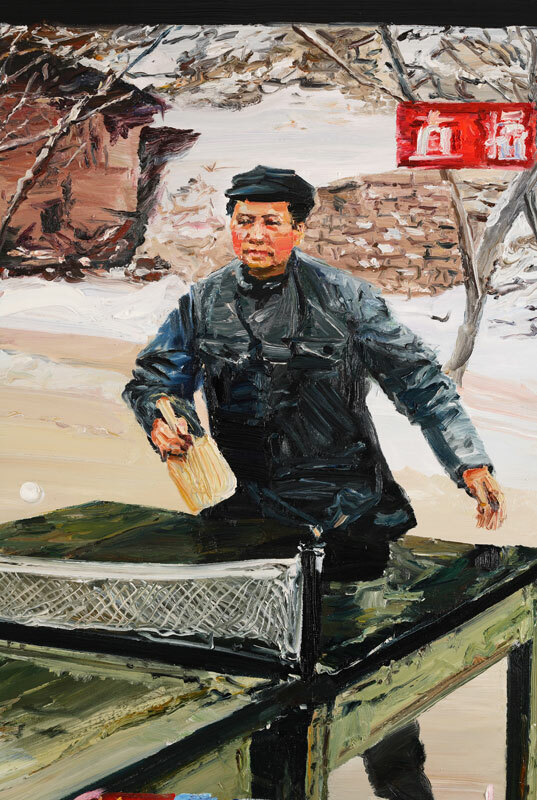 The subject matter of his oil-painting spans from social and historical concerns to personal experience, reading out a panoramic picture of contemporary Chinese life and memories. Each of his painting deserves a close look and the serious comparassion of the pair of the paintings would find a strong sense of time, the consecutive moments of life. The distinguish painterly quality of the works empowers the unique fascination of pictures. Using the traditional medium Li Qing successfully presents a magic pictorial series of contemporary Chinese art. Simultaneously, psychological complexity toward the remarkable social transitions of China is easily understood. His art is a visual game but entwined with social information that reflects the vicissitudes of the society. The subject matter is ordinary, and unnoticed, some are like news photo for a propaganda purpose. He presents a picture that combine with images and reality. Grand rhetoric and heavy theme are non-exist. Li Qing is more interested with an ordinary scene that affects our perception to the world. Having a two-decade social uphail and ideological confliction, to consider the Cynical Realism and radical and bloody performance as parameter in the art world, the society is crying for a more tranquil and rational art, which is therapeutic to the exhausting and anxious souls. 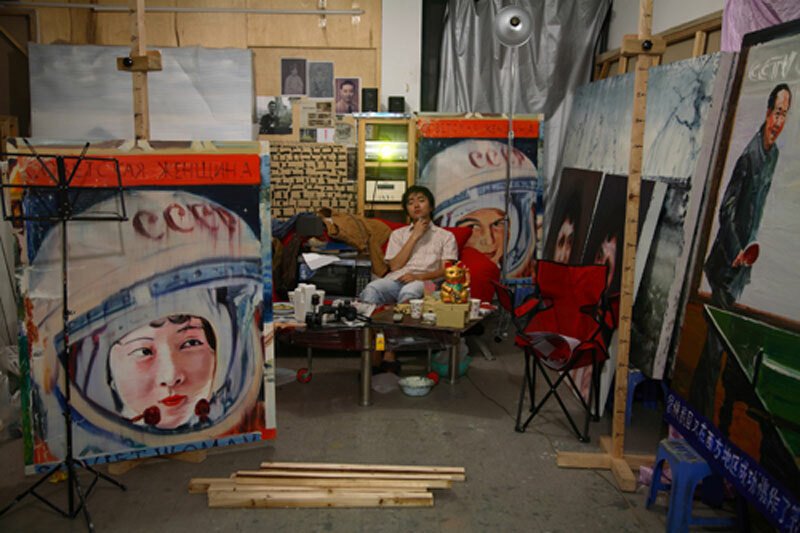 On the other hand, the young generation who born into 1980s, like Li Qing, have experienced little of the national trauma and tragedy, their art are no longer thematically heavy but more metaphorical and painterly quality is emphasized. Li Qing is among those group younger artists. Their emergence in the art scene will be symbolic to Chinese art world and the entire society at large. For the artist his visual game is perhaps a play of pigment and stroke, but his audience there is something significant behind the game.